Malcolm carved a fine sign for my summer cottage on a slab of ash wood. It is the envy of many other cottagers. I wanted to name my home. Malcolm Wall shaped a beautiful sign with a chainsaw out of a butternut log, and then cut Celtic lettering into a flat section in the wood. The result is a gorgeous plaque which I display by the front door. Malcolm carved a door sign for me in cherrywood. 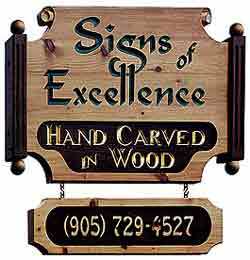 The hand carving is very special and makes a lovely way to welcome guests into my home. Malcolm Wall carved a sign for us in butternut wood. The carving and grain are quite beautiful, and we are thrilled with the result.